The UmRSA® Software is the complete software system needed to analyze RSA® data. Based on more than a decade of research and proven experience, the UmRSA® Software, constitutes the state-of-the art in RSA® technology. 3D motion in vivo can be calculated, illustrated, and analyzed efficiently. The system integrates seamlessly with existing analogue or digital x-ray image archiving systems, regardless of vendor. 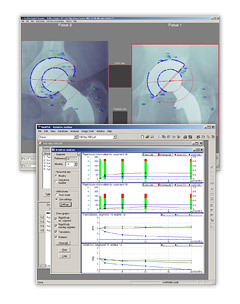 UmRSA® Software is Windows® based and consists of the following modules: UmRSA® Digital Measure™, UmRSA® Analysis™, UmRSA® DICOM Link™. The UmRSA® Digital Measure module includes several innovative features that widen the applications of RSA®. First and foremost, markerless measurement of hemispheric implants, e.g. acetabular cups, greatly extends the potential for research studies and clinical follow-up of patients. New and improved mathematical algorithms yield higher precision than ever. New functions enable faster measurement. Markerless measurement of hemispherical acetabular cups. Maintained precision compared to marked cups. Wear measurements without bone markers. UmRSA Analysis™ uses the measurement data to calculate and graphically illustrate motion, wear, growth, kinematics, and other parameters with micrometric accuracy. The database solution included in UmRSA® Analysis™ allows you to efficiently manage measured data, study-related information, planned follow-ups, patient information, and other data. Visual feedback of trends in rotation and translations. Simplified detection and location of study errors. Customizable data export for statistical analysis. Simplified detection and correction of errors in study data. UmRSA® DICOM Link™ is a crucial part of an UmRSA® system for users with digital x-ray image archives (PACS). The UmRSA® DICOM Link™ module seamlessly connects the UmRSA® Software system to PACS systems, regardless of PACS vendor. Images can easily be searched and retrieved from the PACS, or sent from the PACS to the UmRSA® DICOM Server included in the DICOM Link module.